After she was placed with us, we had to wait 10 days during which the birthparents had the option to revoke their consent and terminate the adoption. It was a dramatic time for us. Our social worker said it was one of the tensest adoptions she had ever worked on. We were on the edge of our seats right up until the evening of the final day. Olivia’s birthmother, who we sadly haven’t seen or heard from since, had detached herself from Olivia and was only invested in her relationship with the birth father. She had become upset and angry during this time over the loss of the relationship and had threatened to revoke a number of times. Olivia’s birth father, on the other hand, has been very involved and has brought with him a big, loving family! My husband and I were kind of overwhelmed in the beginning. We had just become new parents of a newborn baby and now we were having a lot of visits from this new family. Olivia’s birth Grandma was the first to visit and immediately fell head over heels for this little girl! At first, that made us really nervous but she assured us that she had no intention of changing the course of the adoption. Even though she and the rest of the birthfather’s family live in Ontario and we live in Alberta, we knew we’d be seeing and hearing from them a lot! Despite the distance between us, we generally spend a long weekend together every 4-6 weeks when her birth Grandma is in town and we see her birthdad and his siblings regularly too. These people could not have been a better match for us! We all feel so lucky to be a big modern family together! 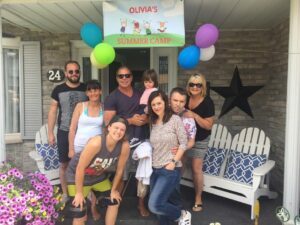 Each year for the past two years of Olivia’s life we have been invited to go spend a week with them at their home. We now know Olivia’s whole extended family as well as lots of the people that shaped her birth Dad’s life! We plan to go again this year. We all call it “Olivia’s Summer Camp”! Of course, just like in every relationship, there have been bumps in ours. Having Olivia’s birth mother leave the equation has been sad for us for sure. But at the end of the day, this little girl has has a close family and a huge extended circle through her birth family. We’re all beyond proud about how these different worlds have circled around her through open adoption. She is one luck little lady! Olivia’s birthfather’s mother and I have become like sisters. It’s been so much better than I could have hoped for! What has helped us make it work is the belief that we all win when we collectively put Olivia’s needs first. And that being open minded and, even more importantly, open hearted is the way to go. My advice to other adoptive and birth families is be open hearted, and put your child’s interests at the centre of all decision-making. Be inclusive and set boundaries when things don’t feel right. No child ever died from being loved too much! Andrea Nagle, and her husband, Dave, live in Alberta, and hope that their adoption story will inspire others to share theirs.